(1) 6 gallon Fermonster primary fermenter - for turning wort (unfermented beer) into beer! Bottling Bucket with spigot - to fill bottles with your fresh homebrew! Bottle Brush - for cleaning, if necessary! 4 oz StarSan - Sanitizer, of course! 8 Gallon Brewers Best Basic Brew Kettle - Perfect for full-boil extract or all grain brewing! A live class for two attendees at our Woburn Warehouse Store! Stainless brewing equipment is the gold-standard for creating wort, or unfermented beer. Typical 5 gallon batches are started with 2-3 gallons of water and all the addtional ingredients. The 8 gallon Brewers Best Basic Brewing Kettle provides ample headroom to virtually eliminate boil-overs. 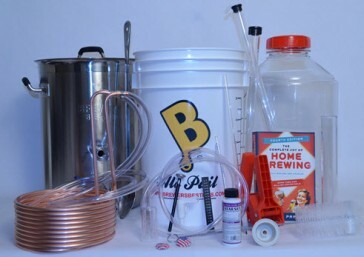 The large 8 gallon capacity allows you to expand into different brewing methods, including full boil extract brewing, brew-in-a-bag and all-grain techniques. The stainless steel spoon is designed for brewing. Its long handle keeps your hands safely away from the warm wort and ensures you can reach the bottom of the brewpot. The 25 foot copper wort chiller cools your craft beer quickly once the boil is finished. A quick chill minimizes the possiblity of infection. Attach your chiler to a garden spigot or laundry sink and run cool water through it to cool your wort in minutes. And if you don`t have access to a laundry sink or outdoor water spigot, use the hose adapter to connect the wort chiller to your kitchen or bathroom sink! 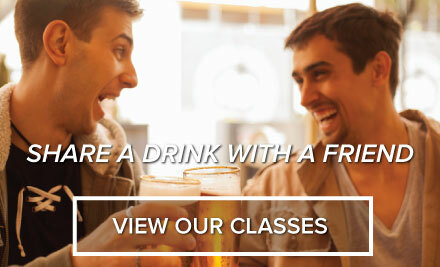 And as always, we are available to help you get brewing every step of the way! The dedicated, knowledgeable Beer & Wine Hobby team is ready to answer your questions via phone, email or social media anytime!